Russia has been showing off its new combat tank design, which officials claim is 20 years ahead of current Western designs. But military analysts question those assertions, and warn the cost could be too heavy a burden for Russia’s struggling economy. During Russia’s Victory Day military parade on May 9, as fighter jets roared overhead and thousands of troops marched through Moscow's Red Square, there was one new piece of hardware that grabbed the world’s attention – the new T-14 Armata tank. It is the trailblazer of Russia’s multi-billion dollar military modernization. 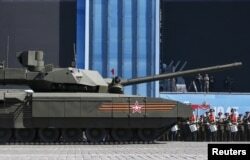 Chief designer Andrei Terlikov of the company Ural Transport Machines said the Armata contains cutting-edge technology – including the first unmanned turret. "The level of automation, the principles we put in it, the technological edge we created represent a decisive step towards more advanced unmanned machines," he said. A Russian serviceman holds a red flag onboard a T-14 Armata tank after it stopped during a rehearsal for the Victory Day parade in Red Square in central Moscow, May 7, 2015. Russia claims the Armata’s so-called explosive reactive armor or "ERA" is capable of withstanding all anti-tank rounds possessed by NATO. Chief designer Andrei Terlikov explained that the tank has an "active protection complex", which allows it to generate a counter-impact against incoming anti-tank rounds, to calculate the impact point, and lower the incoming round's impact or fully destroy it with a defensive weapon. The designers liken operating the tank to playing a computer game. Deputy chief designer Ilya Demchenko said they had a remote-controlled combat module, multi-specter channels, and new algorithyms. He said it's as if the crew played a computer game. It's only left to them to take some conclusive actions, to make the decisions. But the marketing of military hardware should always be taken with a degree of skepticism, said Henry Boyd of the International Institute for Strategic Studies. “Where this puts it in comparison with contemporary Western tank design is something I think we’ll have to wait some time to get a better sense of. It’s inevitably not going to end up with everything that is currently being advertised as possible to put on this platform, the ambition is just going to be too great. Cost will come in at some point,” he said. The cost is estimated at up to $8 million per tank – the same as a light fighter jet. But Western sanctions over Russia’s intervention in Ukraine, and the falling oil prices have hit the Russian economy hard. “The nominal production process is [to begin in] 2018. Whether it even makes that is questionable,” said Boyd. He said it’s unlikely the Armata T-14 tank would be seen on the battlefields of eastern Ukraine – even if the fighting escalated. But Boyd said Russian President Vladimir Putin’s geopolitical doctrine would play a big part in the Armata’s development. “It is not impossible that we will see T-14 being used at the front lines of Russian intervention or quasi-intervention in its near-abroad in the not too distant future,” he said. Moscow denies direct involvement in the conflict in eastern Ukraine. But Russia’s neighbors – and NATO – will be watching the Armata’s development closely as President Putin seeks to modernize the country’s vast armed forces.